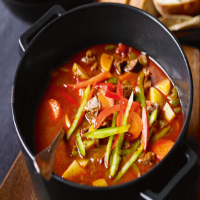 Goulash, the most famous Hungarian dish, is not the stew that many think it is, but a fiery, slow-cooked soup. Serve with crusty bread and crushed chillies - or sliced green and red peppers to garnish. 1. In a large casserole, gently sweat the onion in the oil for 5 minutes, until translucent. Add the beef, sugar and tomato purée and cook, stirring, for a further 5 minutes. 2. Stir in the flour and paprika and cook for 2 minutes. Add the tomatoes, carrots, stock, caraway seeds and seasoning. Simmer for 45 minutes. 3. Add the chopped pepper to the soup (keep a little back to use as a garnish). Simmer for another 15 minutes. Add the potatoes and simmer for 30 minutes more, topping up with a little water if necessary, or adding more paprika, a little at a time, if more robustness is required (though it will take 20 minutes to cook into the soup). 4. Garnish with the reserved pepper and serve with crusty bread and crushed chillies if you like.